Trying to get a perfect 8-hour sleep is such a pain in the… neck. There is something you can do to sleep better and wake up every morning without feeling that annoying neck stiffness. Brace yourself, as you’re about to find the solution to your problems. I’ve found 7 best pillows for neck pain that can transform your sleeping experience from unbearable to incredible. Let’s get started! What’s the Role of Your Sleeping Preferences in Choosing a Pillow for Neck Pain? Cover: copper fibers, 66% polyester, 30% viscose, 4% Lycra spandex. Standard – 4.52 pounds, king – 5.77 pounds. Standard – 18 x 24 x 4 inches, king – 18 x 32 x 4 inches. Cover: Tencel blend. No information Standard – 24 x 16 inches, queen – 27 x 16 inches, king – 32 x 16 inches. Cover: 43% bamboo viscose + 56.4% polyester + 0.6% lycra. Standard – 2.2 pounds, queen – 4.3 pounds, king – 5.2 pounds. Standard – 16.8 x 5.3 x 5.1 inches, queen – 17.8 x 6.7 x 6.2 inches, king – 16.8 x 7.2 x 6.8 inches. Cover: 100% cotton. Queen – 2.6 pounds, king – 3.4 pounds. Queen – 25 x 17 x 5 inches, king – 33 x 17 x 5 inches. Cover: bamboo. Standard – 1.5 pounds, queen – 3 pounds, king – 3.8 pounds. Standard – 20 x 12 inches, queen – 22 x 14 inches, king – 24 x 16 inches. Cover: 60% polyester, 40% bamboo rayon. Standard – 3.46 pounds, queen – 3.75 pounds, king – 4.6 pounds. Standard – 20 x 26 inches, queen – 20 x 30 inches, king – 20 x 36 inches. Cover: cotton infused with a cooling material. No information Standard – 17 x 23 inches. The pillow is available in one firmness option (medium soft) and two sizes (standard and king). It has a hypoallergenic copper-infused cover, which features antimicrobial and cooling properties. Unfortunately, it is not removable, so you can only spot clean it. The company claims you can use a washing machine, but this should be done in a gentle cycle in order not to damage and, consequently, not to void the warranty. The filling consists of natural kapok material, which is soft and breathable, and shredded memory foam, which adds proper support. Kapok is very light and feels almost like down, but is produced from trees rather than gathered from birds. Layla offers a 120-night trial period and a 5-year warranty. The best thing Layla offers is its moldability. You can scrunch and fluff your pillow in order to give it any shape. It conforms to your head and neck very well, which is especially great for people who toss and turn in their sleep, as well as for those who tend to snuggle with their pillow. The worst thing about Layla must be its cover. First, it’s not removable, which makes it inconvenient to clean in case it gets stained. Second, it doesn’t allow you to remove some filling in case its standard amount makes the pillow too thick for your sleeping position. Even though this Layla pillow is a comparatively new model on the market, it is a quality product with lots of benefits. Want to check it yourself? Order your Layla pillow here! The next contestant among the pillows helping with neck pain is this Nest Bedding foam pillow. It is soft, contouring, and nice in its overall appearance. This pillow is adjustable. You can take away as much of the filling as you need to feel comfortable, which makes this item a great pillow for back sleepers with neck pain (as they need their pillow to be thin). 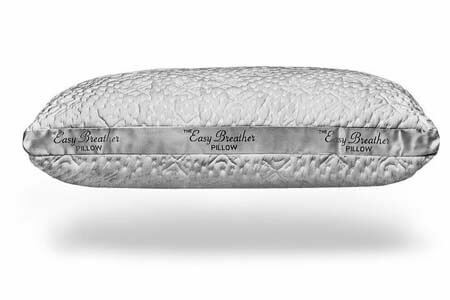 Easy Breather is definitely on the pricier side compared to similar pillows on the market. It is worth every dollar. You will pay more, but you will also receive more – comfort, versatility, and, most importantly, neck pain relief. You can choose between three sizes – standard, queen, and king, but the firmness option is only one – medium. Made of Tencel blend, the cover is soft and breathable. It has a zipper, which allows you to remove the filling if you need. Although you can remove the cover, you still can’t wash it in a washing machine. Thanks to proper air circulation that Tencel fibers provide, the pillow helps you stay cool during the night. 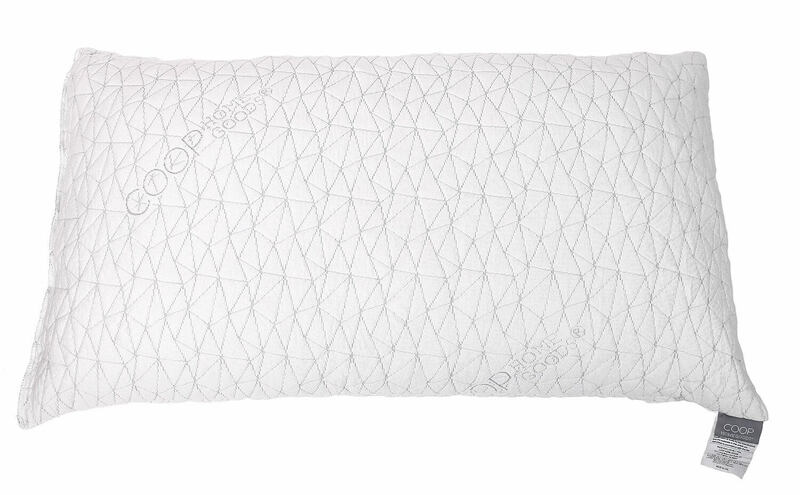 Shredded memory foam, which is the main component of this pillow’s filling, is CertiPUR-US certified. There are a 100-night trial period and a lifetime warranty provided by the company. The coolest thing about this pillow is that you can customize it. Just unzip the cover and remove or add as many of the shredded memory foam pieces as you wish. You might need time to understand what thickness level is the most comfortable for you, but you will definitely find the perfect amount of filling during the 100-night trial period offered by Nest Bedding. The worst flaw one can find in this pillow is all about care conditions. The thing is this pillow doesn’t tolerate machine washing, so you should spot clean it manually, which might be not convenient for some users. A good idea would be to get a pillow protector. But if you add the price of the pillow itself to the price of the protector, you would get quite a sum, which might also be a turn-off for some users. Try it out, and you will see it for yourself. Order Easy Breather here! 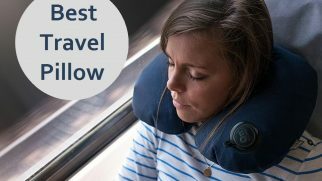 Want to know why this model can be called the best neck support pillow? I will tell you: it is breathable, adjustable, and simply comfortable. As Snuggle-Pedic is more on the firmer side, it will work especially great as a pillow for neck pain side sleepers. They probably won’t even need to make any adjustments and remove any filling to make the pillow comfortable in this sleeping position. Besides, this pillow will be almost equally comfortable for sleepers with different weights. The pillow comes in three different sizes – standard, queen, and king. It features a zipper removable cover, which allows you to remove or add filling to adjust the thickness to your preferences. It is filled with shredded memory foam, which is supportive and cradling. The foam is hypoallergenic and CertiPUR-US certified, which means it doesn’t contain any harmful chemicals. The company offers a 90-day money back guarantee. The coolest thing about this pillow is the pain relief it provides. It’s not just that the pillow is comfortable (which it is). And it’s not that it is able to cradle your head and align the neck and the spine (which it does quite well). It’s also firm enough to provide a bit of resistance to your neck. And that allows your neck muscles to relax completely and you to feel perfectly comfortable and rested. The worst thing I’ve noticed about this pillow (and I had to be very attentive to detect this) is the lumps of shredded foam. They are rather small and I didn’t feel them at all, however, I understand that all people are different and some users might find those lumps to be rather irritating. I must admit: with this pillow, I slept like a baby. And I felt zero neck stiffness in the morning. What else is there to say?
. This pillow can offer you everything you need for a good night’s sleep. With two firmness options and three sizes, Customsleeping offers decent versatility, which allows you to find the perfect pillow to fight neck pain. Moreover, once you find it and purchase it, you can adjust its thickness to suit your sleeping position. You can even buy additional filling to add inside your pillow in case the standard amount is too thin for you. That’s how adjustable it is! The filling is made of the company’s special proprietary Gel Memory-Cluster Fiber Fill, which is soft and machine washable. You can pick between two firmness options: Ideal Comfort and Firm. The pillow comes in two sizes: queen and king. It features four different support zones: the middle neck support zone for back sleepers, two neck support areas for side sleepers, and the headrest section. There is an adjustable pouch in the middle, which you can pull out to adjust the firmness in all of the support zones. The company offers the 30-night risk-free trial. The absolute best thing about this pillow is its construction. The fact that each support section has different thickness makes it comfortable for all sleeping positions. It gets better: you can regulate the filling thickness by adjusting the middle pouch, which makes this pillow customizable. The worst thing I’ve noticed when sleeping on this pillow is the fact that its filling doesn’t stay in one place during the night. Maybe it’s just me (although I’m a rather calm sleeper), but I had to adjust the filling a couple of times in order for it to actually support my neck and not move my head forward. Here’s the deal: this pillow is something extra. And even though it might require you to spend some time adjusting it, I’m sure it will be worth it. It features a wave design to support and to cradle the neck more effectively. The filling is 100% memory foam, which is supportive but doesn’t feel too firm. The cover is made from bamboo, which is great for breathability and temperature regulation. The company offers the no-questions-asked money back guarantee. The best thing about this pillow is the support it provides. Because the memory foam is quite dense, your head and neck won’t sink into it too deeply. At the same time, it is soft enough to contour the head and to keep the neck positioned correctly. The worst thing about this cervical pillow is the smell. 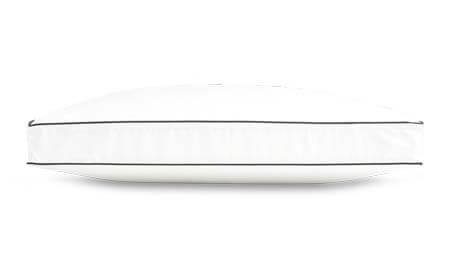 A slight odor is common for the memory foam, and this pillow is not an exception. It took around 2 days for my pillow to air out, only after that I was unable to feel the off-gassing. To tell you the truth, I was a bit skeptical about this top-rated cervical pillow before trying it out. All the praising reviews seemed to be too good to be true. However, I am now another fan of this pillow. Pillows are what Coop Home Goods specializes in, and their premium pillow model called Eden seems to be currently hitting the top. Cool and breathable, it allows for customization to suit your sleeping preferences and help you forget about waking up with neck pain forever. Eden is so soft that it makes you feel you are literally sleeping in the garden of Eden. Because of its softness, it can be a great pillow for stomach sleepers with neck pain. 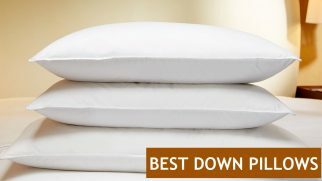 The pillow comes in standard, queen, and king sizes, all offering only one firmness option – medium soft. The bamboo-derived cover is breathable and hypoallergenic. The filling consists of CertiPUR-US certified shredded memory foam, which also is gel-infused to provide a cooling effect for hot sleepers. The inner material is of high quality and doesn’t require frequent fluffing to maintain its supportive shape. You can remove the filling to adjust the height of your pillow. And even more, you can order some extra filling separately in case you want your pillow to be thicker, or to give it a fresher feel. The company offers a 100-night trial period and a 5-year warranty. The best thing about this pillow is its shape retention properties, which means it doesn’t get flat over time. While many other pillows might need constant readjustments and fluffing, this one will keep its shape and stay supportive for years. The most annoying thing about this pillow is, ironically, one of its best features – its softness. As a back sleeper, I personally found the support level to be just fine, but I feel some side sleepers might find it insufficient. This is not a big problem, as you can easily solve it by purchasing additional filling for your pillow. But this means more expenses, so it might be not an option for everyone. Just keep this in mind. 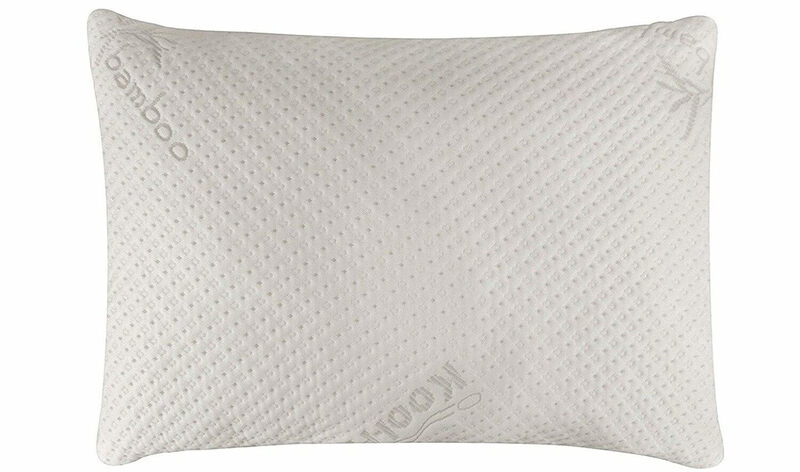 Despite its minor flaws, this pillow has quite a lot to offer to every user, regardless of their sleeping preferences. But thanks to its softness and adjustable thickness, it’s the best choice for stomach sleepers suffering from neck pain. While most pillows on this list are made of shredded memory foam, Nolah AirFoam is a one-piece pillow. Despite that, it can be really effective in helping you get rid of neck pain. Now, what makes it stand out from similar one-piece memory foam pillows is the breathability and cooling effect, which are possible due to a special material mixed into the pillow’s cover. The pillow is standard sized and medium firm. Made from 100% cotton, the pillow’s cover is infused with a cooling material for improved air circulation and temperature regulation. It features a zipper, so it can be removed if it requires washing. The AirFoam is a proprietary blend of high-resilience memory foam inside the Nolah pillow, which is a softer version of the material they use for their mattresses. The company offers a 120-night trial and a 2-year warranty. A 30-night break-in period is required to get a refund. The best thing about this pillow is the hugging feel it offers. Being a 100% memory foam pillow, Nolah AirFoam contours to your neck and head perfectly. But unlike many competitors, this pillow doesn’t make you feel sunk in the foam. The worst thing about this pillow is the lack of versatility. With only one size and one firmness option, it definitely won’t suit everyone. For example, some side sleepers might feel this pillow is too low for them, while some people sleeping on their stomach might, by contrast, find it to be too high. However, you can’t know for sure until you try it, and the company offers great trial conditions to let you do that. To tell you the truth, I am more into adjustable pillows that can fit different sleeping preferences. 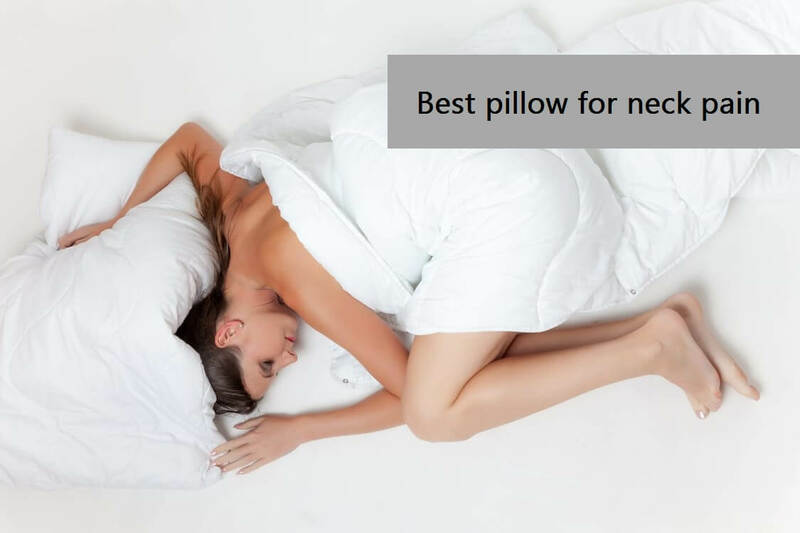 However, this pillow is both soft and supportive enough to conform to your head and neck and help your muscles relax whatever position you sleep in. Want to see it for yourself? Purchase your Nolah pillow here! Firmness. Basically, there are 10 firmness levels that define how a pillow feels. For it to be decently comfortable, the firmness should be around 5-7 out of 10. Such pillows provide a balanced feel, being both soft and supportive at the same time. Shape. The pillow’s ability to relieve neck pain is connected with its shape. Cervical and contoured pillows have a special design, which provides a better alignment of your head and body. However, many pillows of a regular shape are able to conform to your head, neck, and shoulders extremely well and help them relax during the night so that you could wake up with no pain. Ease of cleaning. Pillows with a removable and washable cover are always our favorites. Purchasing one eliminates the need to purchase a pillowcase or protector. However, many models with non-washable covers today are made with stain-resistant materials, which makes spot cleaning quite a fuss-free process. Inner filling features. The best pillows for neck pain are made from memory foam, either completely or partially. But there are other options too. Whatever the material is, we consider its main characteristics (e.g. moldability, off-gassing, shape retention, temperature control, breathability, weight). Safety. We recommend only safe products that improve your sleep and, consequently, health and wellbeing instead of harming you. If it’s a foam pillow, it must be CertiPUR-US certified. If it’s made from latex, then it must have GOTS and GOLS certificates. Trial and warranty conditions. These factors allow users to feel safe when purchasing a new pillow, especially online, without a possibility to try it out in a brick-and-mortar store. Customer satisfaction. Even if we try and like the product, we always check customer reviews across different review platforms to make sure we are not alone. If the vast majority of users report their satisfaction, chances are you will love the pillow too. Your sleeping position is one of the key criteria in a search for a proper pillow. Back sleepers need medium firmness (6 out of 10) and medium thickness (3-5 inches). Side sleepers need thicker (5 inches and more) and firmer (7 out of 10) pillows. And stomach sleepers need softer (4 out of 10) and thinner (3 inches and less) pillows. Do you switch positions during the night (e.g. turning from one side to another or from side to back)? Do you like snuggling with your pillow? Do you usually rest your head in the center of the pillow or on one of the sides? Is your head placed on the pillow entirely or only partially? Sleeping on the wrong pillow. This bedroom item is what directly influences your neck condition. It is supposed to keep it in a neutral position, without making your head fall back or bend upwards. Sleeping on your stomach. It might feel great and super comfortable, but this sleeping position doesn’t do any good for your neck. 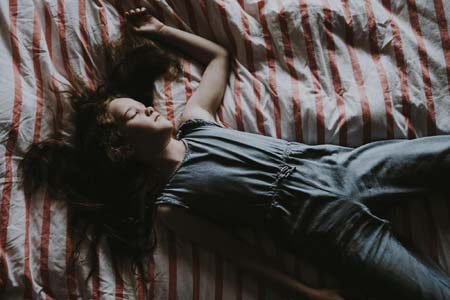 When lying on the stomach, you have to turn your head to the side, twisting the neck and creating an unnecessary pressure and an unhealthy position for it. It’s hard, but consider changing this sleeping habit. Your neck will thank you for that. Sleeping on a bad mattress. Let’s face it: a mattress is as important as the other factors. If it’s old, unsupportive, and saggy, it can give you nothing but health issues. Consider investing in a new mattress if yours is too old or doesn’t feel as comfortable as it used to, and save yourself from hurting all over, not just in your neck. Regular. The traditional rectangular shape is the classics. It is suitable for any sleeping position and even for people with health issues, as long as the pillow is high-quality and supportive. Cervical. This shape might remind you of a cat bed: a hollow in the center for the head and the raised edges for the neck support. This pillow type is often recommended by chiropractors for the neck pain and some spine issues. Contoured. These pillows are also great for neck stiffness, as they have raised edges for the neck support and the recess for the head. Bolster. These are cylindrical pillows, which are more popular among those people who need an extra pillow for their legs or arms. However, some enjoy using a smaller bolster pillow instead of the regular one, as those pillows are able to provide great support for the neck. Memory foam, which is great at providing excellent head and neck support. Feather, which is soft and natural but doesn’t really offer enough support. Synthetic fibers, which are suitable for all sleeping positions and can be very comfortable. Latex, which is very bouncy and supportive but doesn’t offer any adjustment options. Cotton, which is natural and can provide a decent level of support but might get too lumpy with time. Also, you have to consider some lifestyle changes to prevent neck pain. More about it read here. I’m not going to lie: finding a perfect pillow, especially when you have neck issues, is not easy. But I went on this quest to make this task a bit easier for you, and now I’m ready to announce the results. 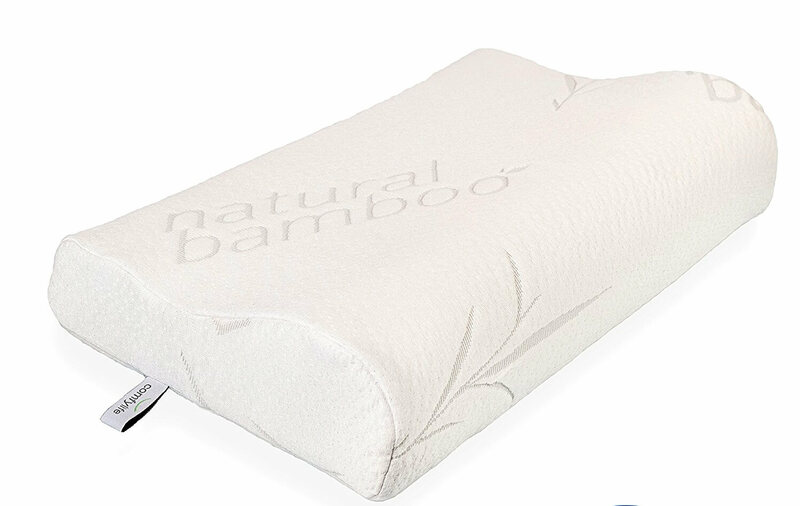 The pillow that impressed me the most was the Ultra-Luxury Bamboo Shredded Memory Foam Pillow by Snuggle-Pedic. It felt the most comfortable, no matter in what position I was sleeping. I couldn’t feel the shredded foam as it cradled my head and neck and helped me relax completely. So, I’m sure you are going to love this pillow as much as I did. Sleep tight! Do you believe that a good pillow can help with pain relief? Share your opinion in the comments! I had complications that led to severe pain on my neck due to my kind of tedious work. But i was referred by Mum to buy original cervical pillow with adjustable neck support has done a great relief work on me. Just that I wasn’t used it initially but I can say am fine now. Once I purchase the original cervical pillow with adjustable neck, does the gel memory cluster fibre fill have an adverse effect on the user? I have a severe respiratory disorder, I hope i get something favourable with this product. Rachel, I would not recommend you to purchase the original pillow. A hypoallergenic bamboo one is the most appropriate option for people with a severe respiratory disorder. I hope this helps you. Usually my adolescent daughter has been complaining of a sharp neck pain. We got a medical directive to use a neck pain pillow alongside her medication. It’s amazing to say that I had the solution here.